Women and beer have a complicated history. Today, it’s natural to assume that beer brewing, packaging, and selling has been a male-dominated field since its inception, but did you know women were actually making beer in the very beginning, as early as the 18th century? Until the industrialization of brewing beer, women participated in both the brewing and selling. But, gradually, this shifted. Women were typically restricted to only selling while men started making the product. In Europe, both single and married women worked in the brewing trade, with married women often working in tandem with their husbands as business partners. This effectively doubled their business and therefore their profits. Today, several breweries are run by husband-and-wife teams, including Sycamore Brewing Company, Odd 13 Brewing, Denizens Brewing Company, Save the World Brewing, Arkose Brewery, Huss Brewing Company, Bone Up Brewing Company, Moustache Brewing, and Big Choice Brewing, among many others. For women, the beer industry has changed immensely, and continues to do so. The Pink Boots Society is comprised of brewers, packagers, designers, servers, writers, and more. They also offer scholarship opportunities to women in the beer industry. We wanted to chat with Emily about the mission, past, present, and future of the Society, and the world of women in beer in general. From there, she immersed herself into several beer-forward environments, eventually leading up to her very own educational beer programs (#pdxbeergeeks and Oregon Beer Country) in Oregon—a bucket-list destination for any craft beer fan. She shared that her “overabundance of excitement and adoration for the industry” is what led to her Executive Director position with Pink Boots. 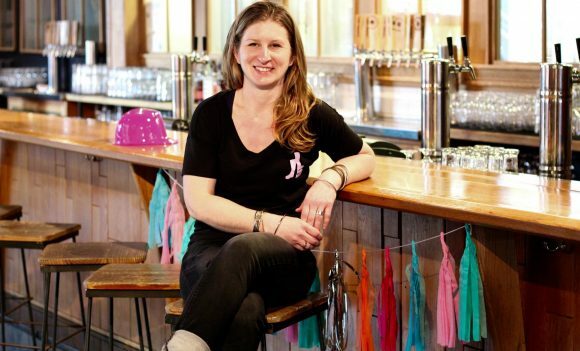 She met the owner, Teri Fahrendorf, an award-winning master brewer, and immediately saw that her own background could boost Pink Boots into something truly special. She recalls, “Eventually my day job took a back seat as I volunteered more and more for Pink Boots and took on more responsibility. I was hired on as the first Executive Director for Pink Boots Society.” And the rest, they say, is history. She says her absolute favorite part about her job is putting faces to the names of women she emails with, hearing how Pink Boots has impacted their lives. Curious where the Pink Boots Society got its name? So were we! Emily explains, “As Teri traveled, she began compiling a contact list of the Brewsters she met and called it the Pink Boots Society after the pink brewing boots she received as a gift from her mother in law and wore while guest-brewing along her journey.” The first Brewster she met was Stone Brewing’s Laura Ulrich. Now, Pink Boots is certainly much more than pink boots. It is “the singular education association for professional women in the beer industry.” A one-of-a-kind organization, they are “the encouraging voice behind the entire beer family,” says Emily. When it comes to women in the beer, Emily hopes we’ll get to a point where we won’t even need to have this conversation. But, it’s important to consider just how and when change is going to happen. Not overnight. “I’m not naïve to the slow rate of change.” She does hope that “we can all help each other to aim for the tipping point where women and men can work together towards the bigger picture, safely and respectfully, no matter what the industry.” Judging by the growing prominence of women in all aspects of the beer industry, we are certainly getting there. While thinking about all of this industry business, it’s important to have fun, too. We asked Emily about what she loves to drink. Being in Oregon, Emily is surrounded by some world-renowned beer, namely DeGarde, one of the few spontaneous-fermentation breweries. And it just happens to be Emily’s favorite style of the moment, too. Though she says she’s gone through many phases, and still loves “a nice soft stout” on nitro, she is digging wild fermentation at the moment. She embraces being able to try any new beer she can—“it’s a whole new world these days!” And her other sparkling drink of choice? Seltzer. “I drink obscene amounts of sparkling water,” she admits. So, there you have it! The future for women in beer is bright, and coming at us pretty quickly. Thanks to organizations like The Pink Boots Society and women like Emily Engdahl, women are embracing their passions in life and just going for it.